In April the Department of Commerce announced the formation of an Internet Policy Task Force to look at the various issues affecting economic growth and job creation through the Internet. Today, the task force issued its first report, a green paper on the framework that the Commerce Department intends to apply to questions about online privacy. Like the Federal Trade Commission (FTC), which released its own privacy report a couple weeks ago, the Department of Commerce is looking for a fresh approach to privacy and a better way to help consumers understand what happens to data online. In particular, the green paper focuses on the need for all global stakeholders — including companies, advocates, and government — to work together to proactively improve privacy. We strongly support the Commerce Department engaging more actively internationally including the creation of a global framework for privacy to better address international data flows. The report also stresses the importance of preserving and encouraging innovation on the Internet. Additionally, the Department calls for a re-examination of the Electronic Communications Privacy Act — generally known by its acronym, ECPA — which dates back to 1986. We’re on board with that, since the outdated law simply has not kept pace with evolving technologies. We support the Department of Commerce’s recommendation for privacy to be approached comprehensively and broadly, with a clear focus both on users and innovation on the Internet. This kind of thoughtful approach to a complex issue like privacy shows leadership and expertise, and we look forward to further dialogue with the Department of Commerce, the FTC, and others as we consider the issues that the green paper has raised. As we’ve said before, we understand that as Google grows, we’re going to face more questions about how our business works. We recognize the responsibility we have, and we are always open to hearing ideas about how we can improve. All companies make “build vs. buy” decisions. Pearlstein writes that he has no problem with Google growing naturally, but that we shouldn’t be allowed to make acquisitions in new spaces. This isn’t how we -- or most companies -- approach these decisions. Sometimes it’s possible to develop a new product in-house; other times a company decides it can bring a new product to market faster by acquiring another company. Microsoft acquired Powerset in 2008 and then incorporated its search technology into Bing. Amazon acquired Zappos in 2009 instead of developing its own shoe-selling site. The Hart-Scott-Rodino legal process ensures that acquisitions like these aren’t implemented if they threaten competition or consumers, and the process works well. We’re competing against other companies for acquisitions. Pearlstein expresses concern that Google’s acquisitions preclude the possibility that a company might instead be purchased by Microsoft, Apple, or Facebook. But those companies not only have substantial cash or equity that they use to make acquisitions, they also regularly compete against us and other companies to acquire leading startups. In 2007, Google bought DoubleClick, but then Microsoft spent twice as much for its display ad company aQuantive and Yahoo bought ad exchange Right Media. All mature companies regularly acquire companies to make big bets on new spaces. Acquisitions are typically good for consumers and the economy. Antitrust law is designed to protect consumers, not competitors, and our acquisitions have created great things for consumers. Our 2004 acquisition of Keyhole led to Google Earth, which for the first time provided free satellite imagery for consumers. Our 2005 acquisition of a small company called Android -- and our investment in the technology that Andy Rubin was developing -- later led to the creation of the Android mobile operating system, which has injected more competition and openness into the smartphone space. For startups, getting acquired is often the path to success (especially given the difficult IPO market), so stopping large companies from making acquisitions would only deprive startups of another potential bidder and investors of a potential return on their invested capital. You can’t be both pro-economic growth and anti-acquisitions. Courts and regulators recognize efficiencies in mergers into new spaces. They also have approved many deals where the leader in one category acquired the leader in a separate category. That includes Oracle’s acquisition of Siebel, Amazon’s acquisition of Audible, and Adobe’s acquisition of Macromedia. Each company was #1 in its respective field, and each merger was approved. These aren’t easy issues -- and we don’t envy the government regulators who have to grapple with them! But most observers would agree that the antitrust laws are pretty durable and the courts have done a good job applying the law to new products and technologies. For our part, we’ll continue to make sure that our business practices reflect our commitment to compete fair and square. This Sunday the Wall Street Journal published a story about local search that makes a number of assertions about how local search works at Google, so we thought it would be helpful to share our view on these issues. Answering users' queries accurately and quickly is our number one goal. Sometimes the best, most relevant answer to a query is our traditional “ten blue links,” and sometimes it is a news article, sports score, stock quote, video, or a map. When someone searches for a place on Google, we still provide the usual web results linking to great sites; we simply organize those results around places to make it much faster to find what you’re looking for. For example, earlier this year we introduced Place Search to help people make more informed decisions about where to go. Place pages organize results around a particular place to help users find great sources of photos, reviews and essential facts. This makes it much easier to see and compare places and find great sites with local information. We’ve heard from users and businesses that Place pages are a great way to find local information and reach customers. We’ve also heard from webmasters that Place pages help them reach a broader audience when users click through to learn more. Keeping in touch with family during the holiday season can be challenging for anyone, but it’s especially difficult for military families with loved ones serving around the country or overseas. Gmail’s built in video chat and free calls to the U.S. and Canada can help keep friends and family in contact regardless of how far apart they may be. To make staying in touch this holiday season even easier for military families, we’re offering a $10 calling credit to help them reach their loved ones serving abroad. These international call credits can be used to make calls with Google Voice or from right inside Gmail, and will provide families with roughly 30 minutes of call time to Afghanistan, 60 minutes to Iraq, or hundreds of minutes to many countries in Europe and around the world. To make this possible, we’ve partnered with Blue Star Families and Sesame Street, two organizations dedicated to supporting service members and their families. 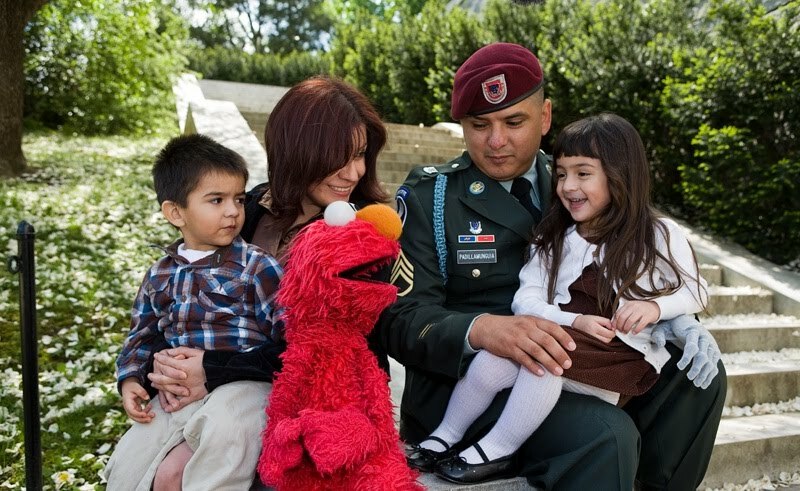 We recognize the sacrifices military family members make when loved ones serve abroad, and we’re proud to help make it a little bit easier for families to stay connected over the holidays. At this time, Google Voice and calling in Gmail are available in the U.S. only. There are more than 1 trillion unique URLs on the web and more than 35 hours of video uploaded to YouTube every minute. It’s some pretty fantastic stuff - content that makes us think, laugh, and learn new things. Services we couldn’t have imagined ten years ago - iTunes, Netflix, YouTube, and many others - help us access this content and let traditional and emerging creators profit from and share their work with the world. But along with this new wave of creators come some bad apples who use the Internet to infringe copyright. As the web has grown, we have seen a growing number of issues relating to infringing content. We respond expeditiously to requests to remove such content from our services, and have been improving our procedures over time. But as the web grows, and the number of requests grows with it, we are working to develop new ways to better address the underlying problem. We’ll act on reliable copyright takedown requests within 24 hours. We will build tools to improve the submission process to make it easier for rightsholders to submit DMCA takedown requests for Google products (starting with Blogger and web Search). And for copyright owners who use the tools responsibly, we’ll reduce our average response time to 24 hours or less. At the same time, we’ll improve our “counter-notice” tools for those who believe their content was wrongly removed and enable public searching of takedown requests. We will prevent terms that are closely associated with piracy from appearing in Autocomplete. While it’s hard to know for sure when search terms are being used to find infringing content, we’ll do our best to prevent Autocomplete from displaying the terms most frequently used for that purpose. We will improve our AdSense anti-piracy review. We have always prohibited the use of our AdSense program on web pages that provide infringing materials. Building on our existing DMCA takedown procedures, we will be working with rightsholders to identify, and, when appropriate, expel violators from the AdSense program. We will experiment to make authorised preview content more readily accessible in search results. Not surprisingly, we’re big fans of making authorised content more accessible on the Internet. Most users want to access legitimate content and are interested in sites that make that content available to them (even if only on a preview basis). We’ll be looking at ways to make this content easier to index and find. These changes build on our continuing efforts, such as Content ID, to give rightsholders choice and control over the use of their content, and we look forward to further refining and improving our processes in ways that help both rightsholders and users. 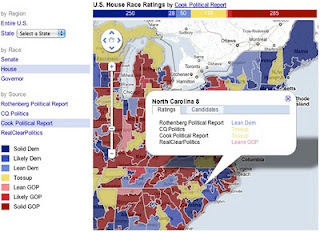 We launched Public Data Explorer in Google Labs nearly a year ago to help make the world’s public data more easily accessible and useful. Since then we’ve added a number of interesting datasets from U.S. government agencies, including the Census Bureau, Energy Information Administration, Bureau of Labor Statistics and Bureau of Economic Analysis. Recently, we made another addition: the Office of Management and Budget (OMB). The OMB‘s mission is to help the President of the United States prepare the budget and oversee its application to federal agencies. As a result, it is also the central clearinghouse for U.S. budget data -- statistics that are now available for the first time in Public Data Explorer. So what does the data show? Check it out and you’ll find a number of interesting things. For example, below are the OMB’s historical and projected net outlays (i.e., money spent) for the federal government. Note the line for “interest on national debt,” which will outpace the Social Security Administration and Department of Defense by 2015. Finally, have you ever been curious how the US Budget gets funded? The chart below shows the distribution in 2009. As always, there are a number of caveats to this data, and we encourage folks to follow up with experts to better understand what it truly means. That said, like all of our public data visualizations, we hope these simple charts will help inform the public debate and illuminate trends and key insights. We encourage you to explore the data, and stay tuned for more! At Google, we’ve always focused on putting the user first by providing the best possible answers as quickly as possible - and our product innovation and engineering talent have delivered results that users seem to like, in a world where the competition is only one click away. However, given our success and the disruptive nature of our business, it’s entirely understandable that we’ve caused unease among other companies and caught the attention of regulators. Today, the European Commission has announced that they will continue to review complaints about Google's search and search advertising. We respect their process and will continue to work closely with the Commission to answer their questions. We built Google for users, not websites. It may seem obvious, but people sometimes forget this -- not every website can come out on top, or even appear on the first page of our results, so there will almost always be website owners who are unhappy about their rankings. The most important thing is that we satisfy our users. We are always clear when we have been paid for promoting a product or service. Before we launched Google, many search engines took money for inclusion in their results without making that clear to users. We have never done that and we always distinguished advertising content from our organic search results. As we experiment with new ad formats and types of content, we promise to continue to be transparent about payments. We aim to be as transparent as possible. We provide more information about how our ranking works than any other major search engine, through our webmaster central site, blog, diagnostic tools, support forum, and YouTube channel. We give our advertisers information about the ad auction, tips on how to improve their ad quality scores, and the ability to simulate their bids to give them more transparency. And we’re committed to increasing that transparency going forward. At the same time, we don’t want to help people game our system. We do everything we can to ensure that the integrity of our results isn’t compromised. Our final principle: the only constant is change. We’ve been working on this stuff for well over a decade, and in that time our search technology has improved by leaps and bounds. Our results are continuing to evolve from a list of websites to something far more dynamic. Today there’s real-time content, automatically translated content, local content (especially important for mobile devices), images, videos, books, and a whole lot more. Users can search by voice -- and in a variety of languages. And we’ve developed new ad formats such as product listing ads and new pricing models such as cost-per-action. We cannot predict where search and online advertising will be headed, but we know for sure that they won’t stay the same. By staying focused on innovation we can continue to make search even better -- for the benefit of users everywhere. About two years ago we announced an initial investment in O3b Networks, whose mission is to bring affordable, high-speed Internet access to emerging markets via satellite. Earlier today O3b announced that it has wrapped up its final funding round before launch, and is planning to launch its first eight satellites in early 2013. O3b stands for the “other 3 billion” – nearly half the world’s population for whom Internet access is scarce and expensive. In remote and developing areas where fiber is unavailable, users rely on slow and often costly satellite connections. To help solve this problem, O3b is planning to launch a constellation of medium-orbit satellites, providing users across 150 countries with high-speed Internet connectivity. These satellites will be four times closer to the Earth than regular geostationary satellites, meaning much faster speeds and a better experience for users. Google’s mission is to organize the world’s information and make it universally accessible and useful, and so we were early supporters of O3b. We’re glad that O3b is now fully funded to build, launch, and operate its first satellites – and remain excited about this project’s potential to bring the benefits of high-speed Internet access to billions of people for the first time. Google D.C. Talk November 30 - Tim Wu: "The Master Switch"
Brilliant. Imaginative. Explosive. These are just some of things people are saying about Columbia professor Tim Wu’s new book, The Master Switch: The Rise and Fall of Information Empires. Part history part crystal ball, The Master Switch analyzes the cycle of innovation to consolidation seen in the telephone, radio and television markets and what that could mean for the Internet. Join Professor Wu tomorrow to discuss the future of regulation in information economies. He’ll explain what the “Master Switch” is and what it could mean for you. He’ll tell us what role the government plays in “the Cycle.” And he’ll explain why the Internet is in danger - and what we can do to save it. Last summer Google Fellow Gwen Glazer at the American Library Association focused on digitization, specifically on for content from small or mid-sized public libraries and other cultural heritage institutions. Rare materials, like local history collections and historic photographs and maps, present significant challenges to digitization, and Gwen’s proposal encouraged the creation of a national program that would digitize these archival materials and collect them in a free online interface to make them available to the public. Ramtin Amtin at the Citizen Lab examined the recent changes to Google in China to study free expression as a human rights issue, and explored Internet censorship as a potential violation of world trade laws. At the Competitive Enterprise Institute, Carolyn Homer wrote a legal paper on the meaning of online privacy policies, and published two op-eds on privacy on AOL News and in AdAge. 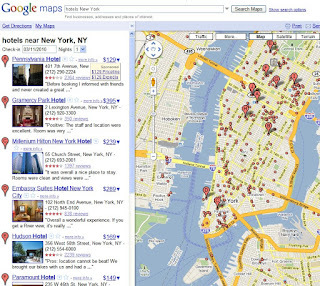 What will Google fellows do summer 2011? That’s up to you. Students of all levels and disciplines interested in Internet policy issues can apply starting today. The deadline for applications is January 17, 2011. Selected students will spend ten weeks this summer working on issues as varied as free expression, privacy, security, and intellectual property with thought leaders at a diverse range of organizations, including: American Library Association, Canadian Internet Policy and Public Interest Clinic, Cato Institute, Center for Democracy and Technology, The Citizen Lab, Competitive Enterprise Institute, Creative Commons, Electronic Frontier Foundation, Future of Music Coalition, Internet Education Foundation, Joint Center for Political and Economic Studies, Media Access Project, National Hispanic Media Coalition, New America Foundation, Public Knowledge, TechFreedom, and the Technology Policy Institute. 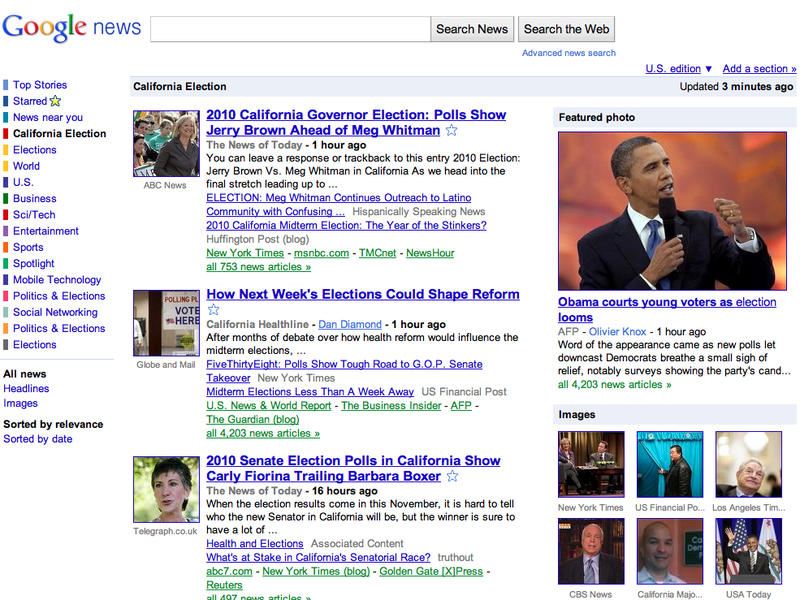 You can learn about the program and host organizations on the Google Public Policy Fellowship website. This afternoon Senator Ron Wyden of Oregon put the spotlight on an issue close to our heart and business operations: the need to protect and promote the free flow of information in international trade agreements. In a hearing on International Trade in the Digital Economy, Senator Wyden called for the U.S. government and others to come together to combat protectionism against digital exports -- a position that mirrors themes we raised in the trade white paper we released earlier this week. At the hearing, Senator Wyden noted how the international reach of American technology companies directly affects the ability of all American companies to export goods and services, both digital and otherwise. The hearing noted the effect of these restrictions on all kinds of American companies, holding back trade and exports whether it is in digital services or physical goods. We commend the Subcommittee’s leadership on this issue and agree with the fundamental principle that new trade agreements should require governments to preserve the free flow of information on the Internet. As a company, we’re particularly focused on the Trans-Pacific Partnership, negotiations among the United States and eight Pacific Rim nations that we hope will produce a first-rate modern trade pact for today’s information economy. Embedding the free flow of information into this agreement will be critical. Testimony and video of the hearing should be online soon at the Subcommittee’s website. Today we’re releasing a white paper [PDF] that explores the ways that governments impose limits on the free flow of information online. It’s pretty wonky stuff, but the premise is simple: In addition to infringing human rights, governments that block the free flow of information on the Internet are also blocking trade and economic growth. Over the last two decades, the Internet has delivered tremendous economic and trade benefits. It has driven record increases in productivity, spurred innovation, created new economies, and fueled international trade. In part this is because the Internet makes geographically distant markets easy to reach. But this engine of economic growth is increasingly coming under attack. According to one study, more than forty governments now engage in broad-scale restriction of online information. Governments are blocking online services, imposing non-transparent regulation, and seeking to incorporate surveillance tools into their Internet infrastructure. These are the trade barriers of the 21st century economy. In the paper we’re releasing today, we urge policymakers in the United States, European Union and elsewhere to take steps to break down barriers to free trade and Internet commerce. These issues present challenges, but also an opportunity for governments to align 21st century trade policy with the 21st century economy. ...In the end, Google has made a legitimate and fair claim to buy ITA Software, and I think there’s a little bit of sour grapes on the part of some of the companies that are not the companies buying ITA. 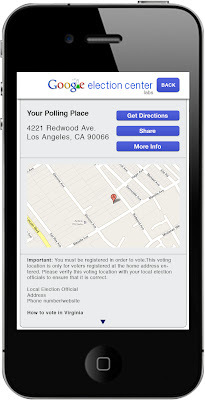 As Americans gear up for the midterm elections on November 2, we wanted to share a few tools that make it easier to gather voting information. 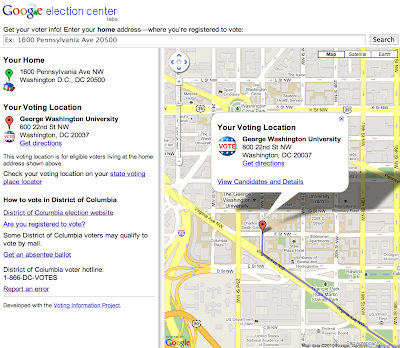 This feature is powered by the Google Election Center, an experimental service that lets election officials provide data directly to Google in order to create a set of search tools. 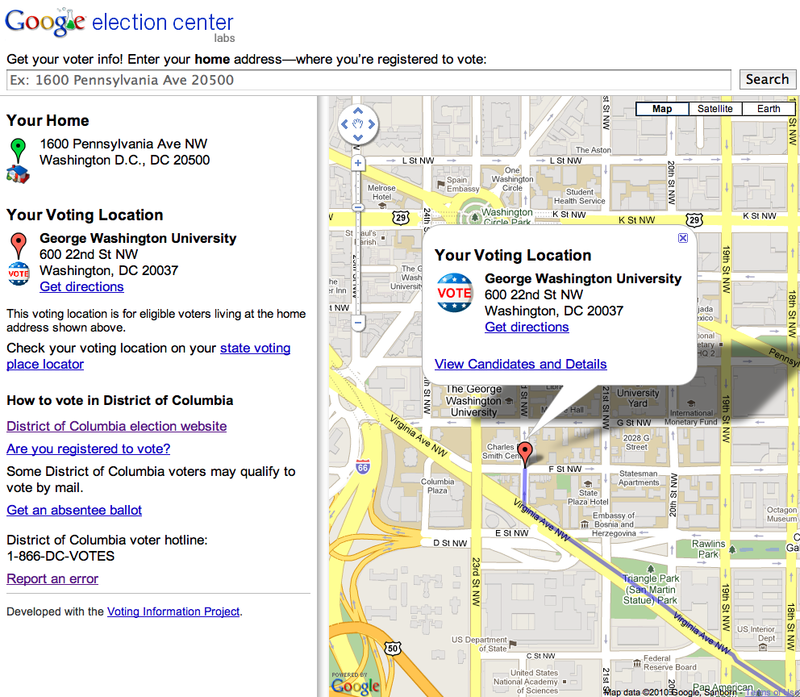 Anyone with a website can also provide this same functionality by embedding the open source Election Center gadget on your site, or use the gadget code or API to build your own. And you don’t need to be at your computer to easily find this information. If you’d rather get it on your mobile device, we’ve also created a mobile landing page: m.google.com/elections. 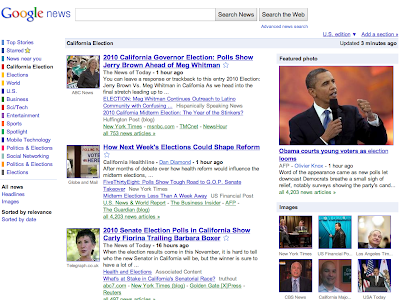 As for election news, you’ll find a special Google News section with stories for each state so you can easily catch up on the latest headlines. 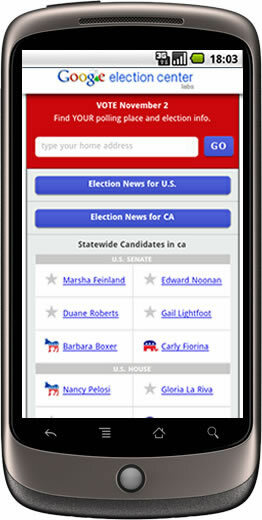 We hope all of these tools help you get and stay informed throughout the election season. Since we announced our plans to acquire ITA Software in July, we’ve spent a lot of time talking with players in the online travel industry -- airlines, travel agents, and search sites -- about our plans to build better flight search tools for users, and our commitment to competition in this space. We’ve been encouraged by the travel industry support we’ve seen for this acquisition -- from airlines, online travel agencies, and also ITA’s competitors. Even longtime travel guru Arthur Frommer has weighed in. That said, it’s disappointing that a number of travel companies have today announced their concerns about the deal. Our reason for making this acquisition is simple: ITA will help us provide better results for our users. When someone searches for “flights from San Francisco to London,” we'd like to provide not just “ten blue links” but exact flight times and prices as well -- just as our competitors do today. Claim: The deal could result in higher travel prices or fewer travel choices for consumers. Fact: ITA and Google are not competitors so there will not be less choice for consumers. In addition, ITA does not set ticket prices or sell tickets, but merely analyzes data about seat availability and fares -- which are set by airlines -- and provides that analysis to websites. So it’s hard to see why it would result in higher prices. In fact, by acquiring ITA we hope to build flight comparison tools that make it easier for users to compare prices and find the best possible deal. Claim: ITA powers most of the web’s most popular travel sites. 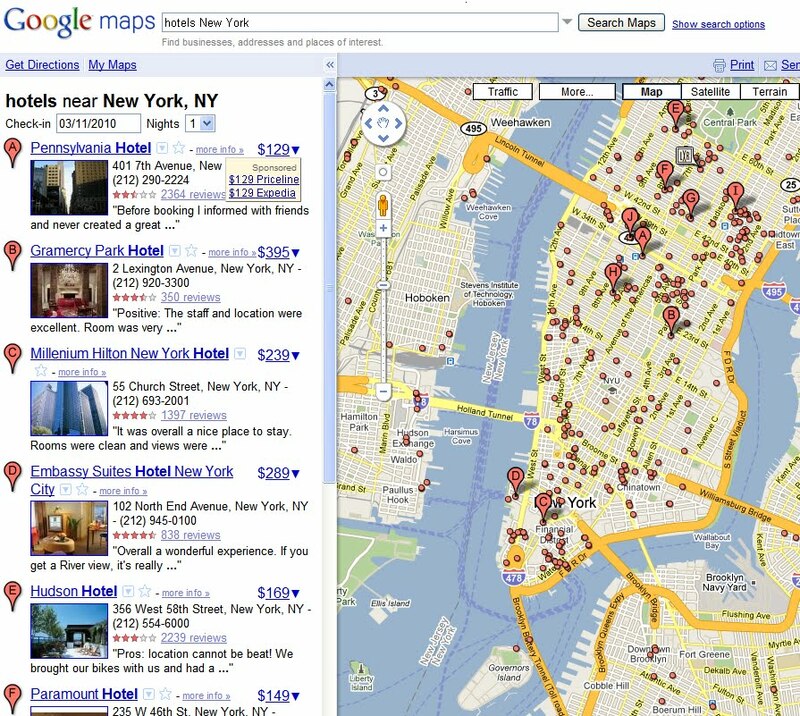 Claim: Google will be choosing winners and losers in online travel. Fact: Our goal is to build tools that drive more traffic to airline and online travel agency sites where customers can purchase tickets. We also believe that giving users better ways to search for flights online will encourage more users to make their flight purchases online, which will create more overall online sales for airlines and travel agencies. Google does not plan to sell airline tickets directly. Claim: Instead of buying ITA, Google could just license its data. Fact: We think we can make more significant innovations and bigger breakthroughs in online flight search for consumers by combining our engineering expertise with ITA’s than we would by just licensing ITA's data service. Claim: The deal will lead to less innovation in travel search. Fact: Just the opposite! Today, finding the right flight at the best price is a frustrating experience; pricing and availability change constantly, and even a simple two-city itinerary involves literally thousands of different options. We’re confident that by combining ITA’s expertise in travel with Google’s technology we’ll be able to create great innovations in flight search. Google Product Manager Jonathan McPhie was in DC recently to meet with privacy advocates, academics and members of the media to help spread the word about our new Privacy Tools page on the Google Privacy Center. While in town we asked Jonathan to explain some simple ways you can take control of your own privacy when using Google. Check out the video. It’s not often that we get to step out of our everyday jobs and spend extended time engaging in global conversations about one of our fundamental values at Google: ensuring access to information. For three days last week in the Hungarian capital, Budapest, we had that chance when more than 300 bloggers, activists, academics, government officials and representatives of non-profits and business convened for “Internet at Liberty 2010.” The conference, which we co-hosted with the Central European University, focused on “the promise and peril of online free expression” and the role of individuals, corporations and government in protecting free expression online. The conference drew participants from 74 countries, including many from places where free expression is constantly under threat—such as Kazakhstan, Tunisia and Zimbabwe. It drew a large contingent of bloggers and activists from the Middle East and representatives from both the Iranian and Chinese diasporas. Our liveblog of the conference was followed by more than 3.3 million people around the world. Everywhere I turned, I was only talking to a repetition of the same monomaniac mind where all the keywords around the conference were defined as dangerous and forbidden: ‘liberty,’ ‘access,’ ‘Internet,’ ‘Google,’ and even such simple words as ‘university,’ ‘conference’ and ‘Europe.’ Upon a second investigation, I realized that they are not afraid of these things because of their intrinsic identity, but because they can transform me from a passive and obedient member of the mass to a free, critical, creative and active citizen. Also at the conference, we introduced Google Transparency Report, an interactive online site that allows users to see where governments are demanding that we remove content and where Google services are being blocked. (Read more in our blog post.) Other sessions included a debate on the question, “Is the potential of the Internet as a force for positive political change being oversold?” and workshops offering practical education and tools for lobbying governments on key issues. Visit our website for the conference, which we plan to turn into a discussion and action forum for those who attended the conference and—we hope—thousands more. Our aim is to bring together people who share the common goal of promoting free expression on the Internet. We want to build constituencies behind key initiatives including helping individuals protect themselves online; promoting corporate and government transparency; finding the right balance between privacy and free expression; and making sure that platforms like Google aren’t held liable for content they host. We’re committed to reaching far beyond the results of the Budapest conference and the banks of the Danube to help ensure that online free expression, like the Internet itself, knows no borders.